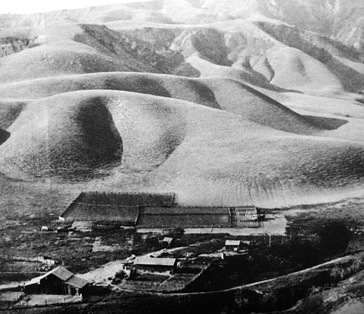 The City of La Habra Heights and most of the City of La Habra reside within the former Rancho La Habra (aka Rancho Cañada de La Habra or “Pass Through the Hills Ranch”), a 6,698-acre Mexican land grant awarded by California’s Mexican Governor Juan B. Alvarado to Mariano Reyes Roldan (municipal council member of Los Angeles) on October 22, 1839. Shaped like a wedge of pie pointed south, this 1.5 square league property was first discovered by Gaspar de Portolà (appointed Governor of California) in 1769. Mariano Reyes Roldan sold the property to Andrés Pico, a brother of Pio Pico. Pío de Jesús Pico (May 5, 1801 – September 11, 1894) was the last governor of Alta California under Mexican rule. 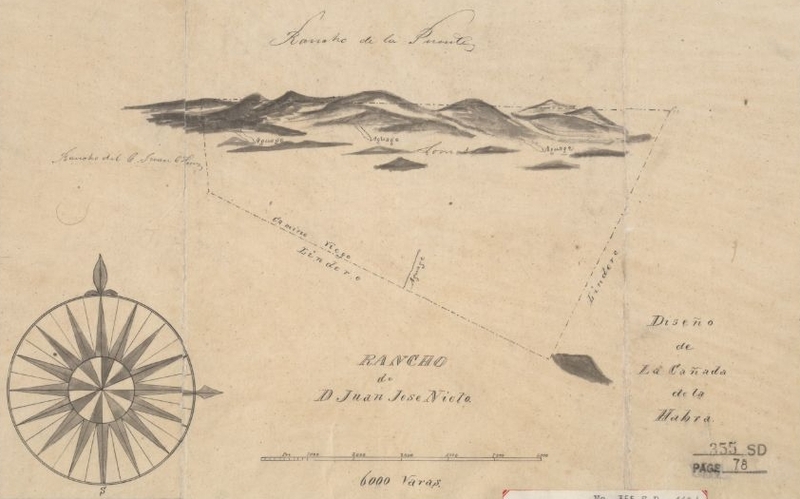 The Picos lost Rancho La Habra to Abel Sterns (one of the region’s wealthiest land owners), who owned a whole collection of ranchos, including La Habra, Los Coyotes, San Juan Colon de Santa Ana, Las Bolsas y Paredes, La Bolsa Chica, Jurupa and La Sierra. He owned land within parts of Los Angeles County and Riverside County. He also owned substantial portions of land within Orange County. He was a cattle baron and was one of the wealthiest men in California during that time period. A great drought in 1861 ruined Sterns and the lands went to businessmen based in San Francisco, who put the lands on the market from $2 to $10 per acre. Many of the purchasers were Basque sheep growers from the Pyrenees mountains. In 1900, Mrs. Dolores Sansinena (born Ordoquí) sold 3500 acres to Willits J. Hole (a real estate developer). 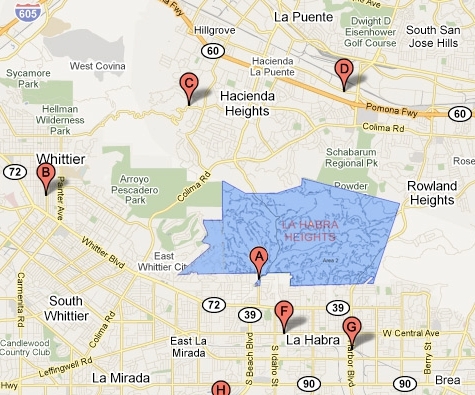 Part of this land became La Habra Heights. It was sold at about $15 per acre. In 1919, WJ Hole sold the land to Edwin G. Hart, another developer. His earlier experiences in Mexico and the development of North Whittier Heights led him to believe that these beautiful frost free hills could evolve into productive avocado groves. Water reached La Habra Heights in quantity in 1921 when the reservoir at Hacienda Rd and East Rd was completed. Edwin G. Hart was President of the Water company from 1919 to 1939. His successors have been H. B. Griswold, P. W. Allen, Ernest Mason, Walter Beck, Fred Nelson, Frank Cressy, David Field and John Hart. In order to initiate and finance the Water Company, Hart rented several large parcels to developers. R. L. Reynolds bought 307 acres west of Hacienda Rd, which became known as Subtropic Farms. Other large parcels went to Switzer syndicate, E. 0. White and Peter Weisel on Fullerton Road, and the Golf course on East Road. Hart also marketed 5+ acre and parcels – many with contracts to put in and develop avocado groves. Some of the early purchasers of avocado land were Clyde Wilcox, Price and Bishop, Wm. Holloway, G. W. Beck, Dr. H. B. Stone-brook, H. B. Griswold and F. D. Halm. During the 1920′s, the peak of development, hundreds of men were employed, including engineering crews, mule skinners, pipe line men, nursery men and laborers building roads and pipe lines, contouring the hills and planting avocados throughout La Habra Heights. Agriculture in the early days was not limited to avocados. Gene Barley and Lauren Meod operated nurseries on East Rd. Flowers were grown on the slopes above the county line. Subtropic Farms raised vegetables such as rhubarb, cucumbers, tomatoes and string beans. Oranges and lemons were planted in the valley. At one time about 40 acres were in citrus production. However, avocados became the dominant agricultural product in La Habra Heights. Their start dates back to George W. Beck who planted avocados along Cypress St in 1910. Later he bought property from Hart on Kashlan and planted more avocados. His son, Walter Beck, became one of the foremost authorities on avocado agriculture. Many new avocado varieties were originated here, including the Hass avocado developed by R. G. Hass. Roads through out La Habra Heights were named for avocado varieties such as: Chota, Dorothea, Popenoe, Sharpless, Ganter, Benick, Kashlan, Mayapan, Nabal, Panchay and Kanola. Ahuacate Rd – of course – means avocado. A 1930 survey showed that there were 1,292 acres of avocado groves, 282 acres of citrus orchards (oranges, lemons, etc), 43 acres of miscellaneous plants like persimmons, cherimoyas, passion fruit, papayas, sapotes, bulbs and flowers for a total of 1,617 developed acres. There were also 95 homes some value at more than $100,000.00. Hacienda Golf Club was one of the earliest arrivals in La Habra Heights. Alphonso Bell, a land owner in Santa Fe Springs, persuaded businessmen in Whittier, Anaheim and Fullerton to start a golf club. Starting with 9 holes and a barn as a club house, Hacienda Golf Club has grown into a beautiful 18 hole golf course with a spacious Spanish style club house. It is now one of the oldest and most picturesque golf clubs in Southern California. Some luxury homes were built in La Habra Heights in the late 1920′s and early 1930′s, such as the Herman Smith and Joy Richart homes an West Rd, the B. F. Axelson, Alden Kerfoot and Demo Harshbarger homes on Avocado Crest, the Weisel and Beckwith homes on Fullerton Rd, the Harshton home on Kanola, and the E. G. Hart, Laura Scudder and 0. 0. Allen homes on Reposado Drive. Dr. Swan’­s home on East Rd was also a show place. All of these home owners may well be termed celebrities. Herman Smith, founder of the Smith Industries International, Inc. is known throughout the oil industry. Dema Harshbarger, spearheaded NBC shows such as the Fred Allen show and later became press agent for Hedda Hopper. Laura Scudder was the potato chip queen. Other celebrities who lived in La Habra Heights included author Kirby Page, fight promoter Frank Church, film start Jack Halt, and prize fighter Todd Margan. Homes ranged from modest to luxury. Nearly all homes were individually designed. Many were hidden in the irregular tree covered terrain and reached only by private roads. A 1926 Edwin G. Hart real estate brochure on La Habra Heights stated, “The Second Beverly Hills has started already. It is dotted with numerous suburban homes of the very finest type.” Demo Harshbarger, originally from Chicago, stated that she came to La Habra Heights after reading a National Geographic article citing the three most beautiful living spots in the world as La Habra Heights and locations in Italy and Africa. By 1939 about 2000 of the original 3500 acres owned by the Hart people had been divided into groves and spacious home parcels owned by about 1800 residents from all parts of the United States. In December 1939, Edwin G. Hart the guiding force in this remarkable community was struck by an automobile and killed. Early in 1939, Edwin G. Hart, Art Sucksdorf, Glen Annabel, Alex Morrison, and H. B. Griswold met at the Dinner Bell Restaurant on Whittier Blvd for the purpose of reorganizing the La Habra Heights Improvement Association. After the Dinner Bell meeting, Griswold called a general meeting at the Hacienda Golf Club. The vision remained unchanged, “To encourage and promote the development of the Heights as a rural residential area.” It worked diligently for agricultural, residential and commercial improvements, such as road side beautification and oil well drilling projects. Prior to 1942, the closest fire station was at San Dimas. In the spring of 1942, Clement F. Levins became the “Father” of the fire department, by suggesting to his friends, Ernest Sherwood, Howard Cooper and Art Sucksdarf, that fire protection was the number one need in the Heights. This small group of men purchased a “nurse” rig from Mr. Cooper and set out to collect funds from their neighbors to pay for it. The fire truck was kept at the ranch of Cecil Knowlton on Fast Rd. On October 8, 1942, the fie department was incorporated. Acting directors were 0. D. Belanger, Art Sucksdorf, Fire Chief, Sam Eastman, Young Wilhite, Larry Marsh and Mr. Levins. With Mr. Wilhite as master of ceremonies, the group held a fund raising campaign in 1945 and raised over $3,000 from their neighbors. As a result of this, a Seagrave fire truck was purchased. As the department grew, the board authorized the installation of many fire hydrants. In 1946 they purchased a new International Army fire truck that carried 400 gallons of water. Today, with a full-time Chief, Fire Marshall and staff, this community is provided with extra-ordinary fire protection at a cost much lower than those communities under Los Angeles County’s protection. Conversion to RA-1 Zoning in 1949 is another outstanding example of community cooperation and purpose. During the 1940′s, there were some signs of deterioration in the Heights. One tract of bottom land, near Encanada, was subdivided into four lots per acre. Another parcel on Avocado Crest, was being cut into approximately 1/2 acre lots. To combat this trend, the Heights’ Association, under President Wilbur Jadden, sought the cooperation of the County Regional Planning Commission, in working out zoning revisions that would ensure the orderly and proper course of development in the future. The association survey showed 81.8% of the residents favored a minimum land area of one acre and the commission’s study showed that nearly 80% of the parcels were approximately that size. The dual efforts of the Association and the Planning Commission resulted in amending the official zoning plan of La Habra Heights by Ordinance No. 5279 (3/1/49) with RA-I zoning (Residential Agriculture 1 acre required). The ordinance also limited the types of commercial agriculture and prohibited roadside stands and signs of any description whatsoever. The 1 acre minimum land requirement recognizes the limited building area on the steep hillsides, and the limited capacity of the scenic winding roads. Moreover, the people who chose this area to live appreciate the rural atmosphere and seclusion afforded by spacious living parcels. From the earliest days of the city, horses and horsemanship have been an important facet of rural life in the Heights. Many property-owners are members of the Highland Riders. Highland Riders have three horse shows a year. One of the goals of the Highland Riders is to interconnect and improve the various trails in the Heights. The gradual change in the image of La Habra Heights as an avocado producing area to one of residential estate character, has continued without interruption. Without a doubt, this rural and secluded community has become one of the most beautiful and desirable residential destinations in Los Angeles County. Its rugged natural beauty and remarkable individualistic people who chose this area for their homes helped La Habra Heights to develop into a community of charm and beauty within the crowded communities of Southern California.